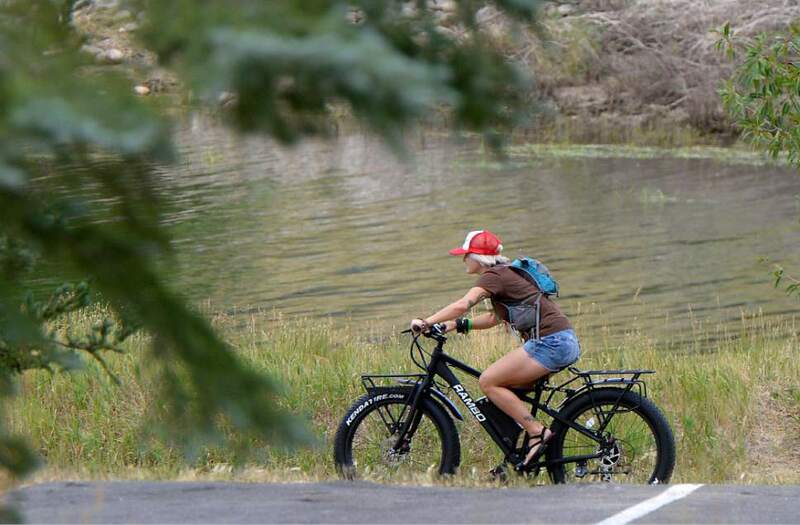 Al Hartmann | The Salt Lake Tribune A participant in the Outdoor Retailer Summer Trade Show tries out a Rambo fat tire motor bike at a demonstration event at Jordanelle State Park on Tuesday, July 25. It is the last time the event will be held in Utah. The Outdoor Industry Association offered some big numbers Wednesday to support its contention that state officials should pay greater attention to the economic contributions of people who recreate outdoors. The OIA report, delivered on the first day of the final Outdoor Retailer Summer Trade Show being held in Salt Lake City, showed that $12.3 billion was spent last year in Utah on outdoor recreation. Outdoor recreation companies supported 110,000 jobs directly, more than twice as many as the mining (32,000) and energy (18,000) sectors combined. The report called attention to those extractive industries, which have received far more support from state officials than outdoor enthusiasts. Because of the state&apos;s backing of efforts to transfer control of public lands from federal to state control and to overturn or shrink Bears Ears and Grand Staircase-Escalante national monuments, OIA and Outdoor Retailer&apos;s owner decided to move the trade shows out of Utah after a two-decade run. Outdoor recreation companies pay $3.9 billion in wages to their 110,000 employees as well as $737 million in state and local taxes, the report said. The Tribune will update this developing story.